DOHA, Qatar, 2019-Feb-12 — /Travel PR News/ — Qatar Airways and Qatar Duty Free (QDF) are once again pleased to sponsor the Qatar Total Open Women’s Tennis Tournament 2019 at the state-of-the-art Khalifa International Tennis and Squash Complex in Doha. 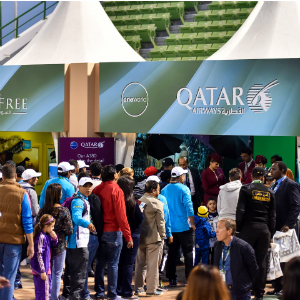 Both Qatar Airways and QDF will host special booths at the sponsors’ village, offering tennis fans a taste of their world-renowned five-star service. The Qatar Airways booth will feature an interactive green screen where tennis fans can get their photos printed on virtual backgrounds featuring destinations such as Doha, Da Nang and Gothenburg and an A350-1000 aircraft. The QDF booth will also feature a quiz accompanied by a photo opportunity where visitors will have to guess the number of branded tennis balls and share it on social media, for a chance to win a hamper filled with exciting prizes offered by Qatar Duty Free. Qatar Duty Free Senior Vice President, Mr. Bruce Bowman, said: “Following our sponsorship at the Qatar ExxonMobil Open 2019 tournament, Qatar Duty Free is once again proud to be actively involved in Qatar’s international calendar of sporting events through our sponsorship of the Qatar Total Open Women’s Tennis Tournament 2019. Qatar has been making headlines in the sports world, most recently with our national team’s memorable win at the Asian Cup 2019. We are pleased to be able to contribute to the country’s vision to ensure we gear up for 2022 FIFA World Cup Qatar™. Qatar Duty Free has also sponsored the Commercial Bank Golf Masters since 2009 and, this year, has extended its sponsorship of this sport to the annual TFWA Golf Tournament at the TFWA World Exhibition & Conference in Cannes, which will welcome more than 3,000 duty free and travel retail brands and 500 international exhibitors, reaching more than 2,000 key executives from major landlords and duty free retailers. This entry was posted in Airlines, Airports, Business, Festivals and Events, Sports, Travel, Travel Services, Travelers and tagged Angelique Kerber, Czech Republic, Doha, Karolina Pliskova, Mr. Bruce Bowman, Ms. Salam Al Shawa, Qatar, Qatar Airways, Qatar Duty Free, Romania, Simona Halep, Tennis Tournament 2019, women. Bookmark the permalink.